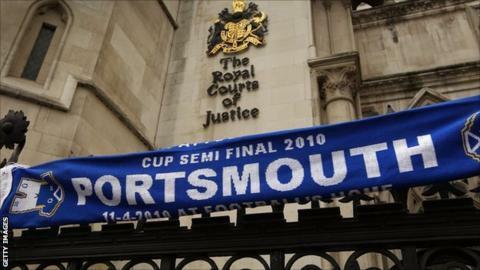 Portsmouth's High Court hearing will finally go ahead on Thursday after four previous adjournments. The initial hearing was postponed because of issues between the property partner working with the Supporters' Trust and the administrators, PKF. Three further hearings have been adjourned, the most recent on 14 February because of a problem with the Professional Footballers' Association. Thursday's hearing will only be to set the date for the full case. It will be heard by Mr Justice Sales at 10.30 GMT in court 10 of the Rolls Building in Fetter Lane. PST - The Supporters' Trust hoping to buy Portsmouth Football Club. PKF - The administrators dealing with the sale of Pompey. Portpin - Former owners of the club, led by Balram Chainrai, who are also vying for control of Pompey. Walker Morris - Law firm representing Portpin/Chainrai. Sacha Gaydamak - Proprietor of land around Fratton Park owned through Miland Developments. David Rubin & Partners LLP - Administrators of Miland Developments. "From the PST's perspective, it's a very significant step as it shows our bid (to buy the club) is moving forward," spokesman Colin Farmery told BBC Radio Solent. "The Football League have said they will only entertain a bid from the PST. PKF always wanted to know they had the deal done and dusted, so from the PST's point of view it is a good sign. "We've been working towards this for the best part of nine months and this is another significant step." Pompey have been in administration since February 2012 and are said to be around £61m in debt. The Trust wants to take over the club and has been approved by the Football League, as well as the club's creditors. However, completion of the deal is conditional on the group also taking control of the club's Fratton Park stadium. The club's former owner Balram Chainrai believes he is owed £12m by Pompey and holds the stadium as security through his company Portpin via a fixed charge. The PST has offered Chainrai £3m for the ground, but the Hong Kong businessman has so far refused to sell. PKF are seeking an independent valuation of Fratton Park and attempting to force the sale through the High Court. But they have been warned by the Football League that Portsmouth face expulsion if they cannot take the club over and come out of administration by the end of the season. "It's in everybody's interests for this to be resolved as quickly as possible," added Farmery. "Is also in everybody's interests for this to be settled out of court if at all possible. The PST bid is clearly proceeding so ultimately that might focus minds and that is is Portpin's court."